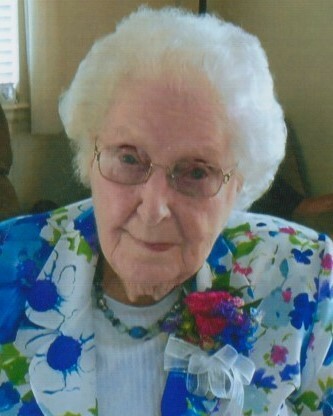 Gladys Christoffersen, 100, of Blair passed away Aug. 20, 2018 after a brief stay in McKee Medical Center in Loveland, Colorado. Gladys was born Aug. 1, 1918, in Washington County, to Caesar and Mary (Mathiesen) Kegler. She graduated from Blair High School after staying out for 2 years to help her dad on the farm. Gladys married Vernon Christoffersen on Dec. 14, 1939. They celebrated their 70th wedding anniversary in 2009. She and Vernon farmed northwest of Blair until they retired and moved to Blair in 1976. She was a lifelong resident of Washington County until she moved to Loveland, CO, on May 1, 2018, to live with her daughter and son-in-law, Verna & Larry Dennis. She & Vernon enjoyed many years of traveling by motorhome both with friends and their camping clubs. Playing cards was a favorite pastime along with embroidering and attending Bench Club. Gladys is survived by her daughters Irene Marhenke (Carl) of Tekamah, NE; Verna Dennis (Larry) of Loveland, CO; Jane Navrude (Harry) of Blair; and Judy Dixon of Hastings, NE. 8 grandchildren and numerous great-grandchildren. She was preceded in death by her husband Vernon; sister Viola and son-in-law Walt Dixon. Campbell Amen Funeral Home is in charge of the arrangements. A Celebration of Life will be held at the funeral home at a later date. Memorials may be directed to Joseph’s Coat.